The story originally appeared on Senior Skiing. 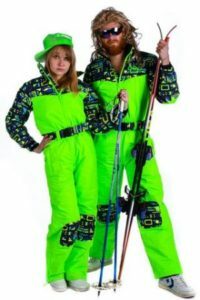 What to wear is a topic that many people don’t understand when it comes to skiing and snowboarding. Below are some clothing tips to absorb. Base layers: Cotton is NOT for skiing, silk could be OK for hot conditions, synthetic (polypropylene, acrylic) and merino wool and combinations of them will work. Some items can be used for 20-plus years with no problem. Do you really want to be seen in a neon jumpsuit from the 1980s? Mid-layers: The same situation as with base layers, major brands make mid-layer jackets combining down with wool and synthetic materials. They are light and practical, if you do not use them as outer layers. Outer layers: You loved your neon overall from 1987? If it still works well and looks well, distinctive, so use it! Check the zippers for leaks, especially if you ski where you may experience rain or wet snow. Sometimes people think their membrane jacket or pants are leaking. It could be delamination of the waterproof breathable layer. Spray DWR (Durable Water Repellant) coating on your jacket, and water will bead off. Goggles and Sunglasses: The foam layer around your face and on the top of the goggles may start crumbling, and, in case of wet snow or rain, your vents will leak. Light sensitive lenses may lose their properties (will not be as dark as before). If you like your old-school sunglasses, and they protect you well from all sides, then use them. Beware, in case of collision, mineral glass may shatter into small sharp pieces. Bags: You will be surprised to find new, more ergonomic and lighter bags for your ski boots, skis and other goodies. New ski boot bags have room for a helmet, goggles, and other critical things. Plastic ski bags will protect your skis, bindings, and poles better than padded ones. Some companies started making light ski bags with wheels that you can roll up when not in use. Bags on wheels will help you to save your back while traveling so you have more energy for skiing. Apres Ski Boots: Old school rubber-leather wool lined boots made by Sorel and Kamik are hard to beat, if staying warm for the entire cold season is your priority. Moon boots are cute. Boots with membrane fabric and soft and grippy soles are light and very comfortable for longer walks, they often look elegant, and they keep you comfortable both in warm and cold conditions. Heaters: Chemical heaters have shelf life of two-to-four years, but they may work outside of this time frame. Don’t throw them away, try them first. Electric heaters, if you ski less than 30 days a season, then your rechargeable batteries should be good for 10 years or more. Editor Note: Senior Skiing correspondent Val E. rummages through his closet to assess what old stuff is still useful and what isn’t. Here’s the second part of his report. The first part dealt with skis, boots and bindings.